Escape to true luxury, relaxation & genuine warmth. You will fall in love with Nanuku. Luxurious, intimate & memorable. *Minimum stay of 5 nights required. High season surcharges apply. Perched atop a hill and boasting dramatic ocean views over Beqa Lagoon the Vunikau suite offers a mix of traditional Fijian design and relaxed contemporary luxury with a private sun deck for lounging, a spacious indoor living area and kitchenette. Luxurious Fiji accommodations offer a master king bedroom that connects to a luxury en suite bathroom with dual granite vanity, separate rainfall shower and soaking spa tub. The hilltop Vunikau Pool Suites offer striking ocean views over Beqa Lagoon and spacious indoor and outdoor living areas with a mix of traditional Fijian design and relaxed contemporary style. Accommodations at our luxury resort in Fiji’s suite include a private wrap around deck that offers space for lounging or entertaining with an infinity edge plunge pool. Suite includes a small seating area and kitchenette. The master king bedroom has a luxurious bathroom en suite featuring a dual granite vanity, a separate rainfall shower, and soaking spa tub. Perfect for a single person or couple who are able to navigate stairs; not suitable for children or physically challenged guests. Enjoy panoramic ocean views from these couples suites located on the top floor of a duplex villa. This suite is 80 sq m of indoor/outdoor living space with a vaulted ceiling and traditional Fijian architecture and decorations. A separate sitting area with a plush sofa or tub chairs, spacious bathrooms feature double vanities, showers built for two and a separate spa tub feature. The balcony has a daybed and a table for 2 to enjoy evening cocktails whilst catching the sunset on the horizon. Beach access is just a short walk from your villa. Absolutely beachfront. Swim the coral reef right off our sandy island resort in Fiji. Enjoy ocean views within your own private tropical garden. 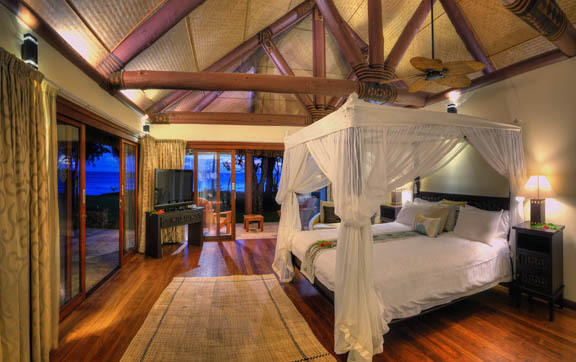 Interior features highlight traditional Fijian design and relaxed contemporary finishes. A spacious king bedroom with separate en suite bathroom leads to a totally separate spa bath tub room that opens to a private outdoor shower. The spa room at this Fiji suite is spacious enough to add 2 extra single beds or a cot for families who need to sleep under one roof on ground level. This stand alone, thatched Fijian bure comes complete with its own private garden courtyard, plunge pool and direct beach access. Perfect for all couples, singles and anyone who may have physical challenges. The Beachfront Pool Villa at our Fijis island resort offers a premier beachfront location with panoramic ocean views, spacious indoor/outdoor living areas with a mix of traditional Fijian design and relaxed contemporary style. 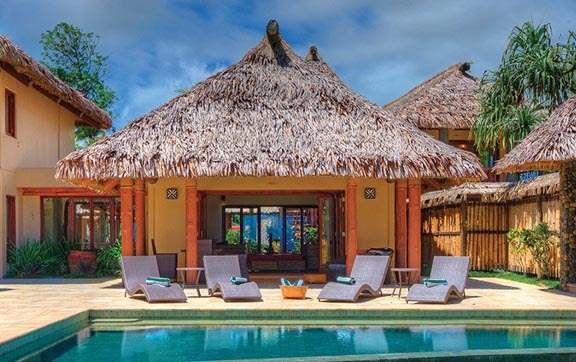 A two story Fijian style building with an external flight of stairs connects two mirror image upper and lower master suites each featuring a separate living area, a mini bar, king bedrooms with en suite bathrooms that feature a separate shower and spa bath. Located in a tropical garden setting with an outdoor living and dining area just off the lower suite and a verandah with daybed on the upper suite. An outdoor courtyard features a private outdoor shower, its own yoga pavilion, daybed, swimming pool and direct beach access just steps to the soft white sand beach. These Beachfront Fiji Private Villas offers great accommodations for guests traveling with three or more adults, for singles or couples with or without children or those who may need ground floor or disabled access. This luxuriously spacious two bedroom beachfront all inclusive private villa offers a premier location with breathtaking ocean views, spacious indoor/outdoor living areas with a mix of traditional Fijian design and relaxed contemporary style. The spacious living area includes a fully equipped kitchen, a dedicated dining area that opens onto alfresco outdoor space, a powder room and a media room for entertaining or as additional guest accommodations. Each master suite features a king bed and an en suite bathroom with dual granite vanity, spa bath and separate rainfall shower. Set within a lush tropical garden with pool, Jacuzzi, yoga pavilion, barbecue, alfresco dining area and daybeds for sunning. These premier accommodations offer direct beach access just steps from the soft white sand beach and is a short stroll to the Clubhouse. Suitable for all guests and is wheelchair accessible. Designed with ultimate privacy in mind, the Vunikau Penthouse suite in Fiji offers extraordinary 180 degree panoramic views over Beqa Lagoon and glorious sunrise/sunset vistas. Luxurious interiors feature a mix of traditional Fijian design and relaxed contemporary style with vaulted bamboo thatched roofs, polished wooden floors and stone walls. Spacious living and dining areas include a dedicated bar, kitchen, media room and even your own billiard table. An expansive wrap around deck for lounging and entertaining features an infinity edge pool, sweeping ocean views and private steps leading directly to the beach and Clubhouse from our resort in Fiji island. The master king bedroom offers a luxurious bathroom featuring dual granite vanity, separate rainfall shower and soaking tub and luxurious Pure Fiji amenities. There is an additional bedroom for 2 singles or a king bed. Perfect for a magical life memory, a small meeting incentive group, a wedding, or an older family who want privacy and lots of space and who are able to navigate stairs. Not suitable for children. A truly grand multiple villa complex, set in an expansive and totally private tropical garden and only a few steps from the white sandy beach and stunning coral reefs of Beqa Lagoon.This expansive hideaway resort in Fiji residence offers four master bedroom suites and ample communal living areas. Interiors feature a mix of traditional Fijian design and relaxed contemporary style with vaulted bamboo thatched roofs, polished wooden floors and custom details. The main living room offers a dedicated space for lounging, full kitchen and multiple indoor and outdoor dining areas. Two upper suites include private verandahs with panoramic ocean views, two lower suites offer private outdoor showers for a total of four king suites, each with luxurious en suite bathrooms, dual granite vanities, rainfall showers and separate spa tubs. An additional media room is perfect for entertaining, additional guest sleeping or even small a meeting. Outdoor features include ample seating, dedicated dining space with a barbecue, sunning area with daybeds, large swimming pool, Jacuzzi and a private yoga pavilion all within a lush garden setting overlooking the Pacific Ocean with direct beach access. Suitable for all guests and is wheelchair accessible. Perched on a dramatic edge overlooking the beautiful Pacific Ocean with panoramic ocean views, the Vunikau Residence is a private complex of four suites each with their own master bedroom and en suite. Interiors highlight traditional Fijian architecture, textiles and finishes with a relaxed contemporary touch. Vaulted bamboo thatched ceilings, rich wood floors, original artwork and luxurious amenities create a premier residential experience. Four master suites feature king bedrooms with luxurious en suite bathrooms that include dual granite vanities, rainfall showers and separate soaking tubs. There are additional single bed accommodations and two powder rooms. 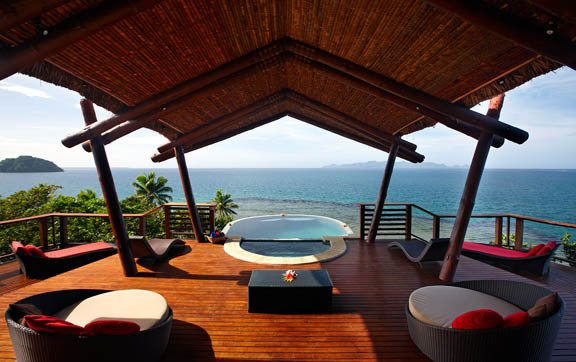 This private Villa in Fiji is a vacation home that can sleep up to 12 adults very comfortably. Spacious living and dining areas, a large kitchen, private bar and billiards table are ideal for entertaining. A large, private media room offers a state of the art entertainment center. An expansive wrap around verandah with a an infinity edge hot tub overlooks the tranquil blue waters below from the upper deck. Additional outdoor features include dedicated living space, separate dining area with barbecue, sun garden with daybeds for lounging, outdoor shower, two additional infinity edge plunge pools and sweeping ocean views. These premier accommodations offer direct beach access just steps from the soft white sand beach. Not suitable for children. The quintessential South Pacific paradise set along the coastline of Fiji’s main island Viti Levu. A sanctuary for relaxation and discovery with 18 Fijian-style suite and villa accommodations, offering innovative all-inclusive dining, secluded beaches, and a luxury Fiji spa. Acclaimed for its blend of contemporary luxury and traditional Fijian culture, the Nanuku Fiji resort promises a vacation you’ll cherish for years to come. Nanuku is located in Pacific Harbour to the mainland of Fiji, Viti Levu. Getting to Nanuku is easy! Vehicle transfer time is approximately two hours & thirty minutes exiting Nadi Airport. Want to arrive a little quicker? Fast air transfers are also available. The private island is located 20 minutes from Nanuku’s Fiji luxury resort in the famous Beqa Lagoon system of coral reefs. Here you’ll find a quintessential deserted island with sand beach, lush rainforest, swaying coconut palms and sandy trails meandering through the shaded canopy. Just two acres in total, the island is surrounded by clear, azure waters and spectacular sandy beaches for private swimming, snorkeling and beachcombing. The surrounding reef system teems with marine life and exotic corals. 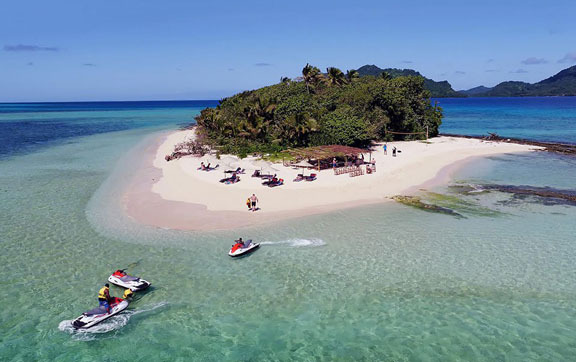 Among the endless array of things to do in Fiji, enjoy a snorkel excursion, scuba diving and gourmet picnic lunch for the ultimate five-star castaway experience. Discover pure relaxations and ultimate bliss. The intimate Lomana Spa and Wellness Centre at Nanuku is a sanctuary for relaxation and rejuvenation. The Fiji spa treatments incorporate fresh local ingredients and ancient methods of massage passed down through generations. Treatments are infused with the essence of Fiji, leaving you with a sense of warmth and wellbeing. The highly skilled spa therapists will help guide your choice of treatments from the special spa menu. World-class cuisine inspired by local ingredients. 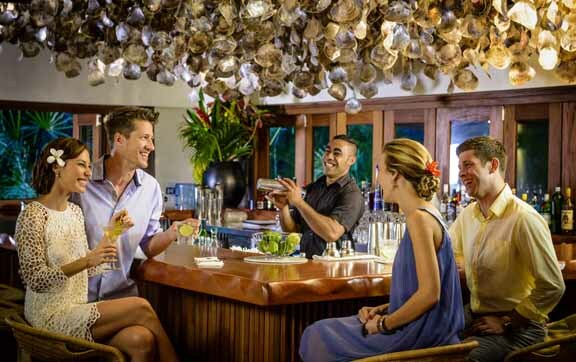 Presented with the passion and authenticity behind every Auberge culinary experience, Nanuku is a Fiji all-inclusive resort and offers a remarkable dining experience as part of your stay. From inventively crafted cuisine to familiar comforts, the menus are inspired by the highest quality and locally sourced ingredients—from garden fresh produce to fresh caught seafood—to create a fabulous fusion of international and Fijian dishes. A totally unique Fiji experience. The blue Pacific Ocean and Pacific Harbour are home to an array of Fiji activities and adventures including outstanding snorkeling, sailing and sport fishing. 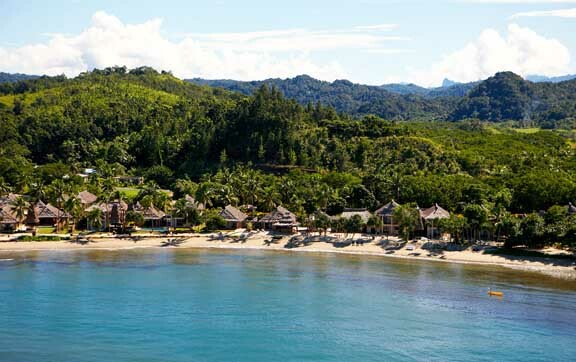 Play championship golf in Fiji and take in the stunning views of the sea and surrounding rainforest. If you are a thrill-seeker, ride down the dunes and try sand boarding, zip-line through a tropical rainforest or discover the many hidden waterfalls on an adventurous hike. For a tranquil experience, unwind at the intimate Fiji spa, lounge the day away in a hammock or sample local arts and culture at Pacific Harbour Village just steps away. There are plenty of fun things to do in Fiji. Explore the island’s legendary coral reef, Beqa passage, which is famous for its world-class snorkeling and diving. Enjoy the underwater wonders in the clear tropical waters and explore the vibrant coral and spectacular reef of Combi. Experience the natural and cultural heritage of the islands on a highlands rafting adventure with Rivers Fiji. Raft deep into the highlands of Namosi, and take in the beauty of emerald rainforests, soaring hanging cliffs and a majestic waterfall.